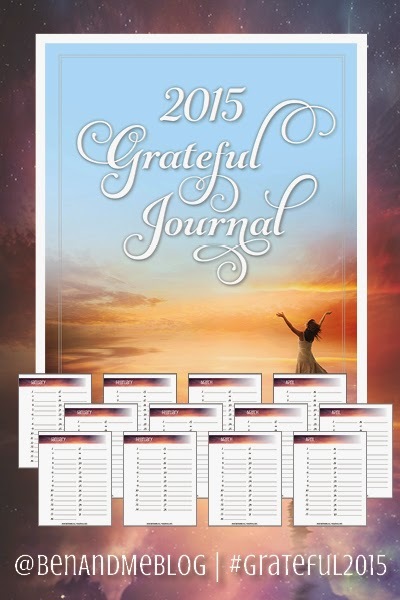 My friend over at Ben and Me created this fantastic 2015 Grateful Journal. It's a really nice way to keep a record of everything you have to be thankful for in the new year, and anytime. It's so easy to get in a slump and succumb to Pity Partydom, but with this journal you can literally flip through your blessings-from big to small-to remember you have a lot for which to be thankful. My family was hit with sudden and unexpected tragedy this week with the loss of a great family friend AND the untimely death of a young, close family member who was in the prime of her life. Even with this sadness, there are still many blessings to appreciate. Again, this 2015 Grateful Journal is FREE, so show some Open Window love to Ben and Me, and check it out for yourself. Love and prayers to you all for a happy and blessed 2015!